Disaster Dogs learn a bark indication. Whether it’s our live-find dogs or our cadaver dogs finding scent, they need to perform a focused bark alert. 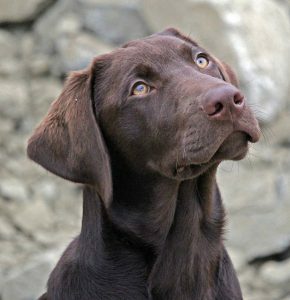 The dog needs to get as close as possible and needs to bark until the handler arrives and sees exactly where the dog is indicating. This might take up to a couple of minutes! 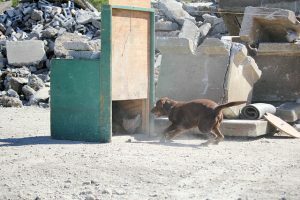 Our dogs need to range far and work out of sight of their handlers, and the dogs move much faster over difficult terrain than their handlers. When the handler reaches the dog, he or she will reward the dog and, taking air flow and terrain into account, mark where the dog alerted. Two of the tools we use to train a focused bark alert are the bark barrels and the bark box (Ensler Box). 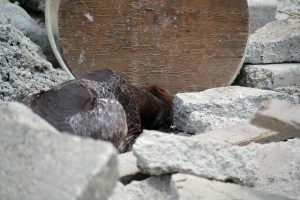 The barrels contain the scent and control where the scent will come out. This helps teach the dogs to focus on the strongest scent when alerting. We start with one barrel and quickly progress to multiple barrels. Sometimes barrels are lined up next to each other or behind each other. Sometimes we use a barrel field: a wide area with lots of barrels. 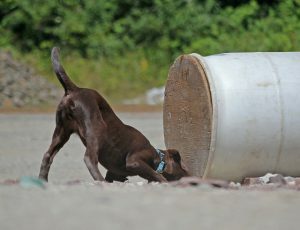 The dogs need to find the “hot barrel” – the one (or more) barrel with a live human hidden in it. 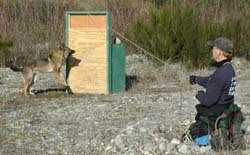 This is one of the ways we teach our young dogs to use their nose and to range and cover a whole area. Porter running a barrel drill. 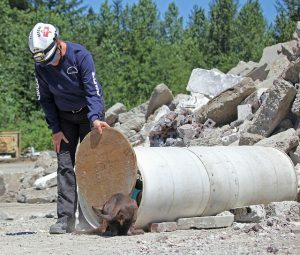 Here puppy Porter learns to use his nose to find the barrel that contains the live human: Porter Barrel Line Up. The bark box helps us to practice focused alerts and penetrating behavior. We want our dogs to get as close as possible to the victim. If possible they are supposed to push into the hiding spot.